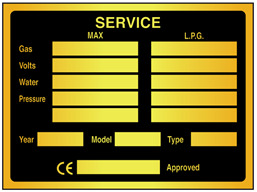 Home > Labels,Tags & Nameplates > Custom Nameplates > Brass Nameplates (Single Colour) > Brass nameplate (1 colour), 73mm x 98mm. Brass nameplate (1 colour), 73mm x 98mm. Items per quantity: Pack of 100. Please enter any additional information. Please upload your custom design. A single colour print applies to this part. A full design proof will be supplied for your approval, prior to production. For initial orders, a tooling charge is applied to enable the creation of your product. This tool is for your sole use. Repeat orders for identical designs do not incur a tooling charge, as the tool already exists. If the order you are placing is a repeat order, please click the "Existing Tool" button to reference your product. Please supply your tooling reference number so that no tooling charge is applied to your repeat order. If you have any difficulty in obtaining this reference, please contact us so that we can assist you. Brass nameplate (1 colour), 20mm x 40mm. Brass nameplate (1 colour), 25mm x 25mm. Brass nameplate (1 colour), 50mm x 100mm. Brass nameplate (1 colour), 50mm x 50mm. Brass nameplate (1 colour), 50mm x 75mm. Custom etched and filled brass nameplate to your own design. Size 73mm x 98mm. Supplied either with adhesive backing or drill holes for fixing. Supplied in packs of 100 nameplates. Custom printed labels. Stainless brass, 0.5mm thickness, etched and filled to your own design in a single colour. Nameplates are abrasion, chemical and weather resistant. Supplied either with self adhesive backing or drill holes for fixing. In packs of 100 nameplates. NMR5B Size 73mm x 98mm. Material Brass.